So, you probably heard of all kinds of cleansing or detoxification programs out there, but the truth is that a lot of cleansing products have little actual detoxifying effect. 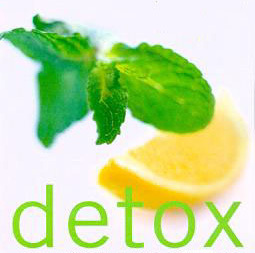 True detoxification has to be distinguished from so commonly seen purgative and diuretic effects. While promoting the function of bowels and kidneys is important, true detoxification can only occur at a cellular level. So, how do our cells accomplish this? Well, I can demystify this marvelous process that takes place in our bodies every single day. Our bodies are capable of getting rid of many poisonous or harmful substances out of our systems through various ways: bowels, kidneys, lymphatics, liver, lungs and skin. Some of the well known toxins we are exposed to are: environmental pollutants, pesticides, toxic pharmaceuticals, heavy metals, cigarette smoke, various carcinogens, exhaust fumes etc. 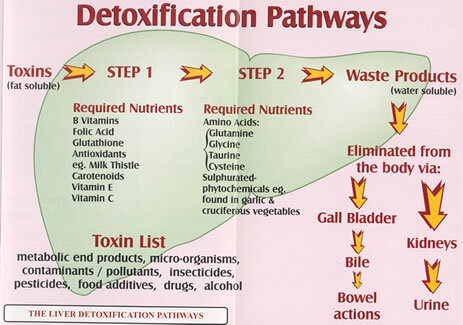 The major and most important organ responsible for detoxifying these harmful substances is our liver. Among many other responsibilities that the liver has been entrusted with, the liver acts as the processing center and filter to help keep us healthy. 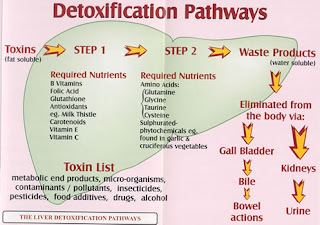 OK, so liver is important but how does it accomplish this huge task of detoxification? The liver is equipped with 2 major detoxification pathways known as Phase I and Phase II. Phase I detoxification involves cytochrome P450 enzymes. It is the first step in neutralizing toxins in our body. Phase I will attempt to change the toxin’s chemical composition enough to make it possible for it to be picked up by Phase II pathway. It is accomplished by using oxidation, reduction, hydrolysis, hydration and dehalogenation reactions. All this means is that, by using the above reactions, the toxins in question are primed or prepared for the final step – Phase II. Unfortunately, many times, these half processed chemicals (called intermediate metabolites) can be more dangerous or active then its original form. This is where the importance of unhindered and well functioning Phase II comes in. Phase II pathway is central to an effective detoxification. It needs to work well to get rid of all the active Phase I intermediates; otherwise we create a bottle neck that lets active toxins circulate throughout our body and potentially damaging tissues in their path. Phase II utilizes conjugation reactions like: sulfation, glucuronidation, glutathione, amino acid conjugation, acetlylation, methylation. These reactions allow the intermediates to be neutralized and made more water soluble and therefore can exit our bodies. Although, Phase I pathways play an extremely important role in detoxification, it is Phase II that ultimately does the job and makes it possible for toxins to leave our bodies. So, whenever you encounter a detoxification product or program you must wonder what does it really do? Does it affect Phase I or Phase II or both? 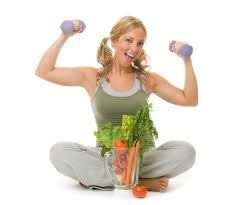 It is important to keep in mind that everybody is different and detoxification programs have to reflect that as well. It is best to see a professional health practitioner to have the right detoxification program chosen for you given your overall health assessment.